If you’ve never met Mara Junot, you may not understand why every man and woman who meets her has an instant crush on her. She exudes a charm, jubilance, intelligence and 50,000 megawatt smile that envelopes everyone…EVERYone who meets her. But that’s not what makes her a great voice-over talent. But it is her talent COMBINED with all of the above that makes her a star. 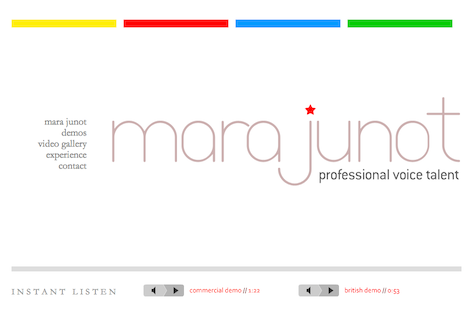 And while there is a star on her website, that’s not why I think it’s a great site. Certainly it’s not because it’s adorned by her lovely pictures (which it ain’t). 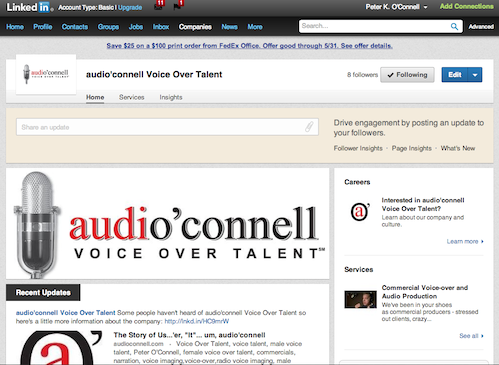 It’s that the simplicity of the site let’s you get a sense of the talent while allowing the demos to take center stage. When you hear that voice (which is terrific) come out of that web site you are focused on the sound…not the performer, not clutter. Sound. It’s what voice-talents’ sell. Mara does it well. Dave Courvoisier has 1,823,234 subscribers to his blog so the chances that you, gentle reader, have NOT seen this post is slim but I’m going to tell you about it anyway in case your RSS feed crapped out. 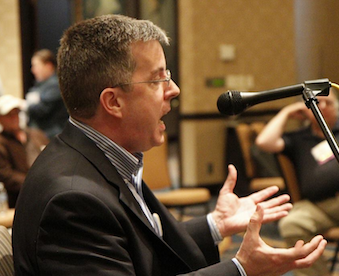 At FaffCamp, Cliff Zellman unveiled his new demo production company, Done By Six Productions (disclaimer – I’m one of the directors because the federal government mandated that, for equality purposes, he hire an Irishman…it was a nasty lawsuit and he lost). I could describe it further but I’d rather you read Dave’s blog post and watch the video interview featuring Cliff. My friend Sean Caldwell is known best as one of America’s premiere promo voice talents but he’s also pretty handy with a camera. 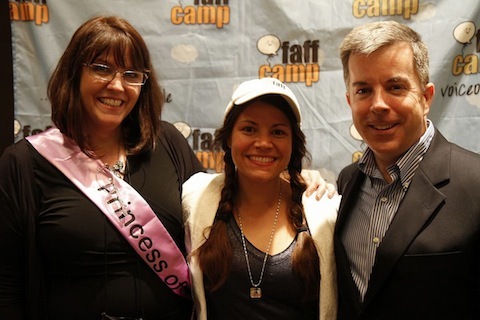 He was kind enough to share this shot of my friends and fellow voice-over talents Amy Snively and Lauren McCullough who, along with Dan Friedman and Natalie Stanfield Thomas (and about a billion other folks), put together Faff-events. I am very blessed to be included with all these talented people. Knowing that I would be in Pittsburgh, PA a few days after FaffCamp, I went on the web to see if the Pittsburgh Pirates were going to be playing a home game and it turned out they WERE home on Tuesday. So when I saw Pittsburgian voice talent Bob Souer and his talented editor son Eric at FaffCamp, I asked if they wanted to join me for the game. They said they were already going and plans were set. 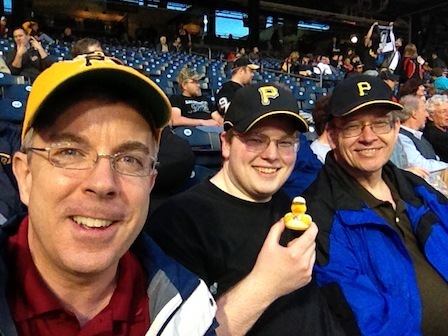 Rains came and went just before game time and we had a wonderful time: me, Eric, Bob and FaffCamp duck Daffy Gormon. And the Bucs beat the Mariners 4-1. Great night thanks to Bob and Eric!